In “The Year of the Ladybird” we follow a student called David as he takes a job at a seaside holiday resort in Skegness, Lincolnshire, during what was to become the hottest summer on record. It’s 1976, the paint is peeling off the economy and nationalism is beginning to take a hold in the less well-off areas of the country. Once at the resort David finds an industry in decline thanks to the wide availability of cheap package holidays overseas. David’s parents are disappointed by his choice of employment to say the least. His stepfather is most put out, having gone to some lengths to create an opening within his building company. His mother is deeply upset because David is returning to the scene of his father’s death – something that happened when David was just a toddler. But still David came. It just felt like the right place to be. Pretty soon David settles into his assorted roles throughout the park, getting to know his fellow Greencoats and the other members of staff in the process, including resident nutjob, Colin, and his wife, Terri. David’s life becomes tangled when he finds himself drawn to Terri, a woman in thrall of Colin. More worrying for David is that Colin seems to have taken a shine to him. Things take a turn for the bizarre when David catches occasional glimpses of a father and his young son. The father is wearing a dark suit wholly unsuited to the hot weather and carries what looks like a loop of rope over his shoulder. His young son waves to David, as if eager to join in the activities he’s supervising. A second look, however, and the pair are gone. As the summer progresses the temperature rises, tensions mount between the staff, and the number of ladybirds flying about the place creeps ever higher. Okay, bear with me, folks. There’s a point to be made here, honest. There are some people in the world who are so ridiculously good at what they do that it often appears effortless. Consider the brilliant vocals of both Paul Rodgers and Bill Withers, for example. Listen to “My Brother Jake” or “Grandma’s Hands” and you could be fooled into thinking those bluesy, laid-back vocals are easy. That is, of course, until you try singing them yourself. Reality then crashes in and you find yourself standing in a karaoke bar hollering at a bunch of drunk businessmen. Or something. The same can be said of writing. Pick up a novel and you may be tempted to say “I could have written that”. But you would be wrong. Ignore plot, characters and the setting for a moment and consider something just as important: style. It’s the secret ingredient that stops a story going in like a diesel daiquiri. The smoother the style, the easier the read and the better chance a story has to take root. “The Year of the Ladybird” represents some of the best writing I’ve read in a long, long time, and for me the key lies in it’s uncomplicated style. Not once was I fighting against unnecessarily verbose sentences. I never longed for the end of a dreary paragraph. Each and every scene in the book was timed to perfection, never once outstaying its welcome. I can usually gauge how well a novel has grabbed my attention by how often I find my eyes drifting towards the page numbers. Within the space of two train journeys I had glanced at the page number twice: each time to pop in a bookmark, and each time I was surprised at how much of the story I’d yomped through. Not only do we find a beautifully-written story in “The Year of the Ladybird” but we also have some excellent and truly memorable characters. David’s roommate, Nobby, Manchester’s finest motormouth, is a brilliant comic creation who steals every scene he is in. Nikki, with whom David frequently finds himself paired, is a wonderful and sympathetic character who tries to keep him on the straight and narrow. The best of the bunch, however, is Colin: a truly terrifying man dripping with malice and barely-suppressed violence. He’s like a coiled spring that has been filed down to a razor’s edge and you can feel your stomach lurch whenever he makes his presence felt. Another thing that impressed me was the restraint shown throughout the story. The creeping nationalism of the time (something that sadly seems to be making a comeback) could have been easily overplayed. Not so here. There’s no drum-banging or chest-beating, just the characters behaving in exactly the way you would have expected back in the day, and so the intelligence of the reader is treated with a great deal of respect. The downside of this, if there is one, is that David can sometimes come across as a little too naive. There are a few times you think to yourself “I wouldn’t have done that.” When David questions his actions you wonder if there is a hint of authorial voice there. But this is a minor gripe against an overwhelmingly excellent novel and one I would recommend you snap up immediately. I’m almost ashamed to say this is the first and only novel by Graham Joyce that I’ve read. It’s a situation I hope to rectify soon. 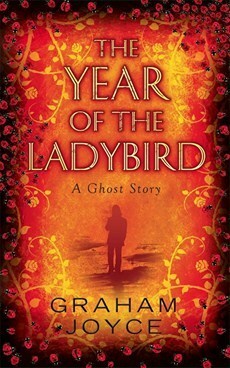 This entry was posted in Books, Reviews and tagged book, ghosts, graham joyce, review, the year of the ladybird by Lucian Poll. Bookmark the permalink.